Complementary medicine does no longer work without a networked understanding of reality. In order to enable the patient to heal himself and act out his skills and aptitudes, physical burdens must be removed as well as psycho-emotional and spiritual chains and dogmas. In order to enable the therapist to accompany his patient correctly on his way, he needs a comprehensive understanding of causes and effects, not only in the field of medicine, but also in history, religion, psychology and sociology. The practitioner of today should be well schooled in the knowledge of life and human nature in order be able to show his patient the right way. For this, networked thinking is essential and this is in the heart of the training of the Academy for Consciousness Medicine. 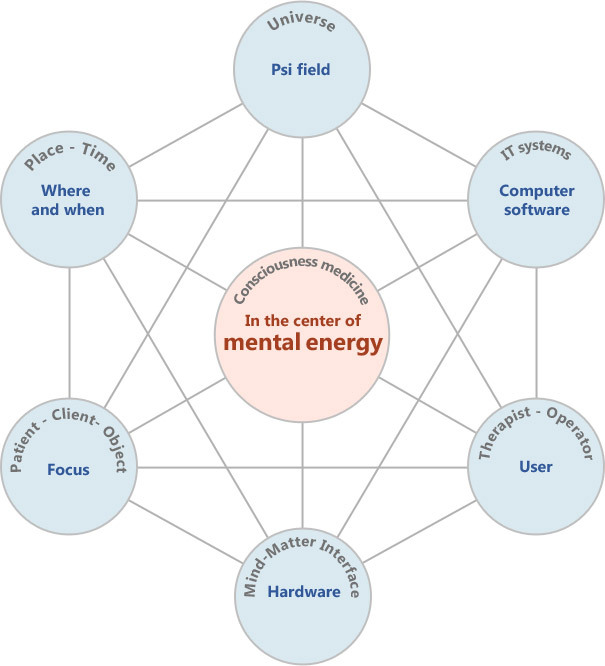 The model shows the influencing factors and interactions that synergistically work together. The individual points symbolize the visible and invisible forces of the respective active triangles. In the middle is the center of the mind force. The model is used to present and explain the method, but is not the reality, just as little as a film is not life or a calendar time.